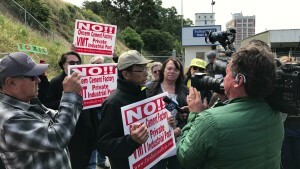 On May 10, 2017, the powerful San Francisco-based International Longshore and Warehouse Union 10 announced its strong opposition to the proposed Orcem Cement Factory and Vallejo Marine Terminal. The project was rejected by the Vallejo Planning Commission on March 6, 2017. The full Vallejo City Council is expected to vote on the plan at the pair of meetings, May 30 & June 1—starting early afternoon. The President of ILWU Local 10, Edwin Ferris, was joined by other union members and people from the community, including representatives from Migrante Napa Solano, Supervisor for District 2, Monica Brown, and Peter Brooks, president Fresh Air Vallejo, at the briefing. Both Ferris and Brooks released statements ahead of Wednesday’s press conference. 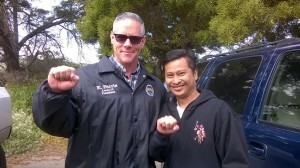 “ILWU Local 10 supports the citizens of Vallejo in their opposition to the proposed Vallejo Marine Terminal project. It would be quite irresponsible to support this proposed project at the expense of the health of the environment and the local community,” said Ferris. “Shiploads of industrial waste from Asia and Mexico for the proposed Orcem cement factory and Vallejo Marine Terminal should never be unloaded on Vallejo’s waterfront so close to homes and a school. We are grateful the ILWU sees that the job numbers Orcem and VMT have tried to claim are grossly inflated for a project whose harm to Vallejo outweighs any possible benefit,” said Brooks. The Redwood Chapter of the Sierra Club (Solano and Napa groups), Fresh Air Vallejo and other community groups all oppose the project, noting that it is an “environmental nightmare,” and would pose significant environmental problems and health dangers to nearby homes and school.